Today we were in Kyoto in order to see the float precession of the Gion Matsuri. This is one of Japan's most significant festivals with events related to the festival occurring for the whole month of July. It also has a long history, dating all the way back to the year 869! Although Gion is a famous area in Kyoto, most of the activities related to the Gion Festival actually occur not in Gion but way on the other side of the river. The precession started at 09:00, but we were not in any rush as we decided to view it from the area near the end of the route. So after Kate paid for a hotel breakfast, we left our luggage at the hotel, caught the subway down to Karasuma-Oike station and wandered down the main street. The road in this area had been closed and there were a few rows of seating which you could pay for in advance, though they were empty at this point. We thought we should walk down a bit so we wouldn't have to wait as long for the floats. As we got closer the crowd started to get much thicker. 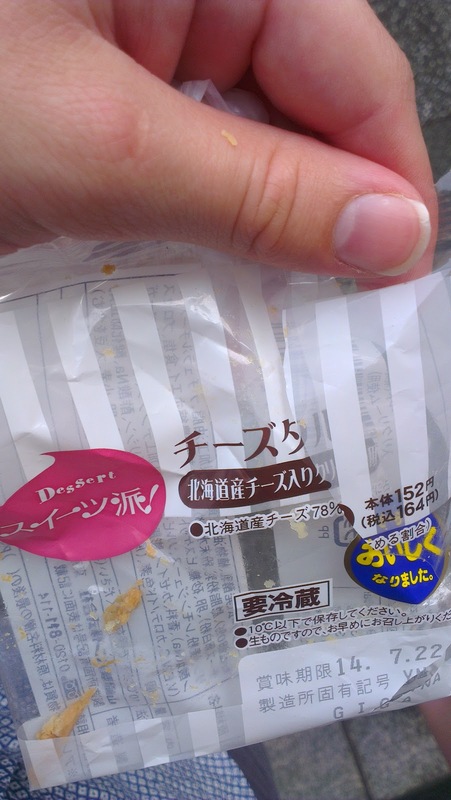 Along the way I stopped at a convenience store and bought an extremely delicious cheese desert thing for breakfast- it was from Hokkaido! Eventually the crowds got pretty serious so we decided to stop and wait as we'd managed to find a decent place to sit where we could see over the paid seating (on a bit of a garden/drain ledge immediately behind the seats). Although there was a fair number of people walking around, almost all of the paid seating was still vacant. It was an extremely hot day today and the humidity was very high! Thanks to that, we had the uncomfortable experience of having a puddle of sweat form around where we were sitting. A lot of people were waving around hand held fans and I did too for a bit, though it was also kind of annoying. Luckily I was able to cool down using shaved ice. It was very refreshing and helped me deal with the heat very well though I started to depend on it as I'd heat up rapidly after consuming the last mouth full. All in all I spent about $16! As time went on, the seats started to fill and eventually some Japanese people came and sat next to us. They were a daughter, her mother, and her grandmother. The grandmother was very friendly and I talked to her a little, she told me they lived in Kyoto and that she was 80 years old! She didn't look a day over 50! Talking about ages of things, she also told me that the festival was over 1000 years old! I was amazed as at the time I had no idea of the history. Actually, it wasn't that unbelievable as it was taking about as long for the precession to reach us! Every now and again there was an announcement over the speakers stating that the festival had reached a certain landmark, but this didn't really help me as I had no idea where those were. However, eventually we finally saw it in the distance!! It would be here soon! It took ages to progress! The people we could see at the front would slowly move forward for a little while but would soon stop and stay still for dozens of minutes. Honestly we were both a bit under-whelmed at the time. I think the long wait in the hot sun had taken its toll on our enjoyment and patience. I mean there were a couple of interesting dances and music but it wasn't amazing, and was a bit repetitive. Some of the floats were were definitely interesting, and there were very large wooden structures full of people playing flutes. It wasn't just us the heat was affecting though with even the participants of the festival looking hot and tired. My advice would definitely be to secure a spot near the start of the morning where it won't be as hot, the wait won't be as long and everyone will still be energetic. After we'd seen many of the floats we decided to head off. On the way back we passed a building that had heaps of school kids hanging out of the windows to look at the spectacle outside. Schools contained within one giant building are interesting to me because schools to me were always a bunch of one or two story buildings spread out across a large block of land. After the festival we went to a shopping centre and had lunch. I think it was something pretty boring like Subway and McDonalds. We had a look at the different levels and found some UFO machines to play. 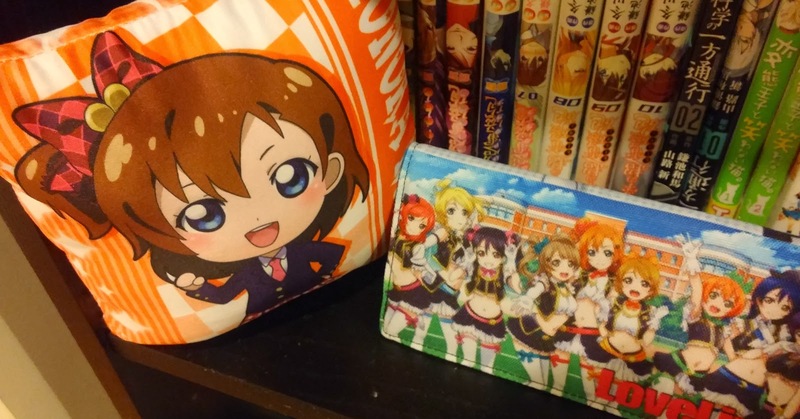 I managed to win a Love Live wallet on my first go! Kate tried a couple of times to win a Love Live pillow and got really close! Generally the key to these machines is knowing when to walk away, and she decided it was time to walk away. A young schoolboy played the machine after and managed to finish off what Kate had started with one go! He then gave Kate the present! She was very happy, and thanked him a lot for his kindness! The way the prizes worked with that machine was that you could actually pick which character you would like to receive after winning and Kate chose the main character: Kousaka Honoka. Our next destination was Takamatsu, and the best way to get there from Kyoto is to catch a bus, unless you're in a hurry or have a rail pass. Neither of which applied to us, so bus it was. Because of the crowds associated with the festival we'd made sure to buy our ticket for the 16:50 service when we arrived yesterday. After collecting our bags from the hotel and making our way to Kyoto Station, I had to quickly rush off to the Yodobashi electronics store. The problem was that I had brought along a standard SD card which was nearly full. When I went to transfer the photos to my laptop I realised that it only had a micro SD card slot! So I went off to buy a microSD card. I had a huge amount of trouble deciding due to relatively high prices, and ultimately picked a Lexar, which one day decided to just stop working for no apparent reason! Luckily this happened after we had returned and backed up the photos, so I didn't lose any data. After that we went and caught our bus. It was a good thing we'd booked as it was pretty full inside. The bus itself was pretty standard, our luggage was stored underneath and I think there was a toilet at the back. We went over the Akashi Kaikyo Bridge, which contains the world’s largest suspension bridge span. We'd actually climbed to the top of the very tall pylons supporting the road deck a few years ago. We then travelled along Awaji Island, across the Naturo Straights and continued west along Shikoku to Takamatsu. As the trip was quite long we stopped at a Family Mart along the way briefly so everyone could get out, use the rest rooms and stock up on snacks. All up it took us three and a half hours and we arrived in Takamatsu at around half past eight. As it was quite late we pretty much just went straight to our hotel and didn't get anything beyond some convenience store food for dinner. Tomorrow we'll be exploring Takamatsu and Megijima Island! Thank you for the story of the festival and I will keep your tips in mind. I enjoyed reading your story and I found it funny making me laugh out loud a few times.